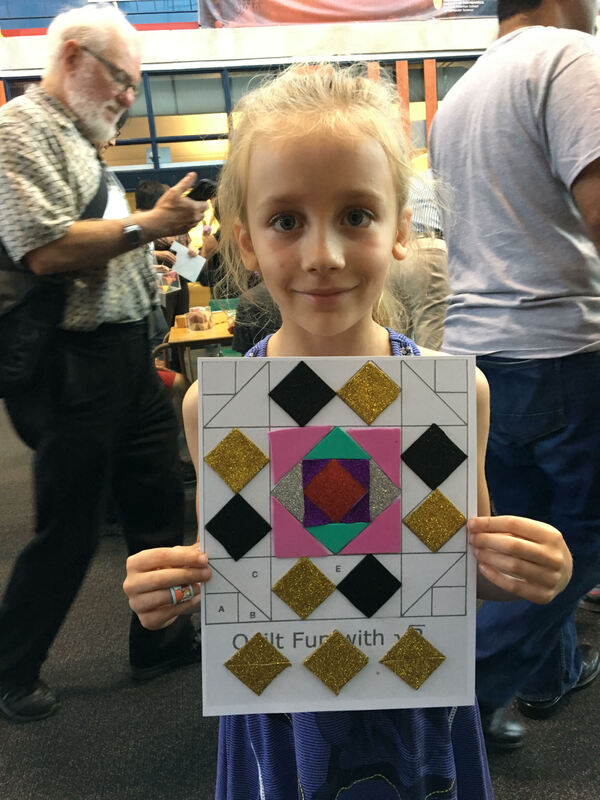 FAMILY DAY & MATH-ART EXPO | …the math sensation! 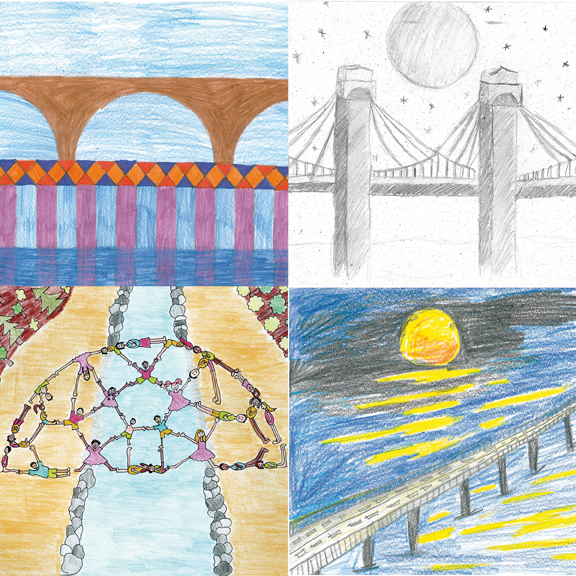 Our goal is to offer a math-art-experience, an on-site immersion into the funworld of mathematics and arts. If the weather permits, the museum hosts will take you outdoors. Together, you will explore a water rocket or giant soap bubbles experiments and you will also learn all about the science behind the experiments. If it rains, we will move indoors for an exciting science show instead. 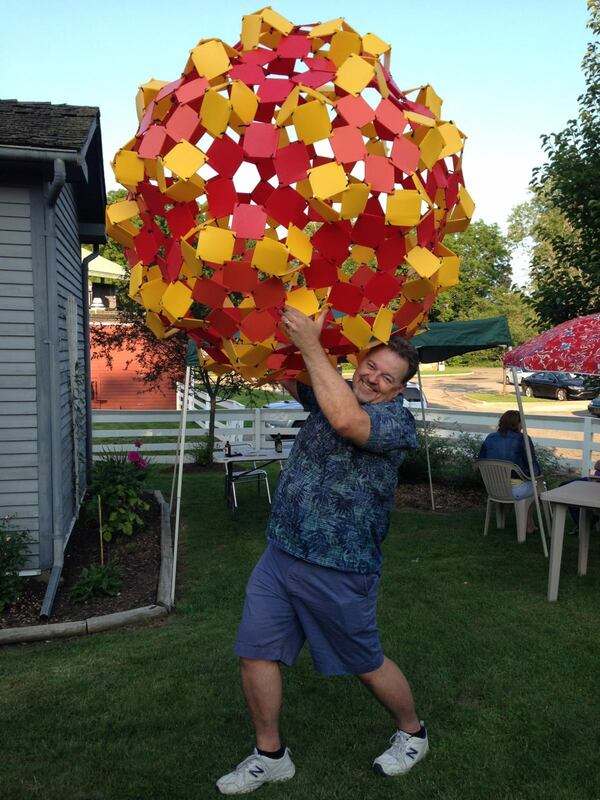 We will build dodecahedra and icosahedra from punch out card stock sheets. 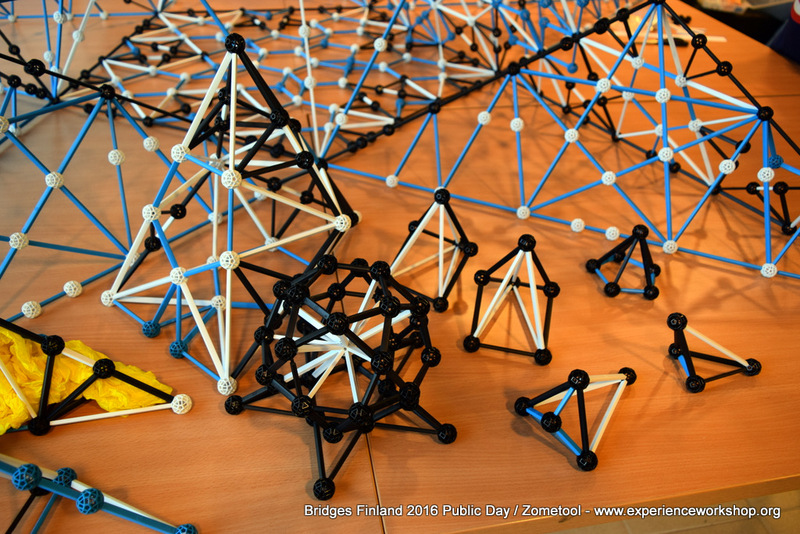 These polyhedra are decorated with Persian patterns designed by Bridges founder Reza Sarhangi. String figures, the imaginative designs created with simple loops of string, are found among the world’s most ancient cultures, but these loops may also be used to create remarkable polyhedral structures. Participants will use loops of string to form polyhedra and other geometric designs, and morph one to another in surprising ways. Similar geometric and polyhedral designs will be created with fingers and arms, and puzzles with straw polyhedra will be presented. 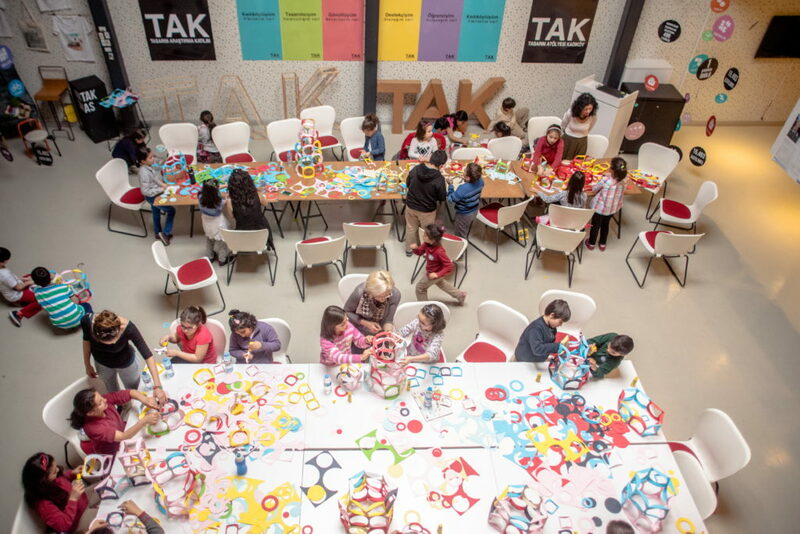 GOMYAP workshops are based on a paper toy named GOM (Geometrical Object Making), created by Gizem Aytaç in order to emphasize the collaboration between geometry and the design process. Participants’ can create their dream models. Come and fold a long origami worm and play with it in board games. Neel Shrestha is 10 year old. He is an Origami enthusiast. 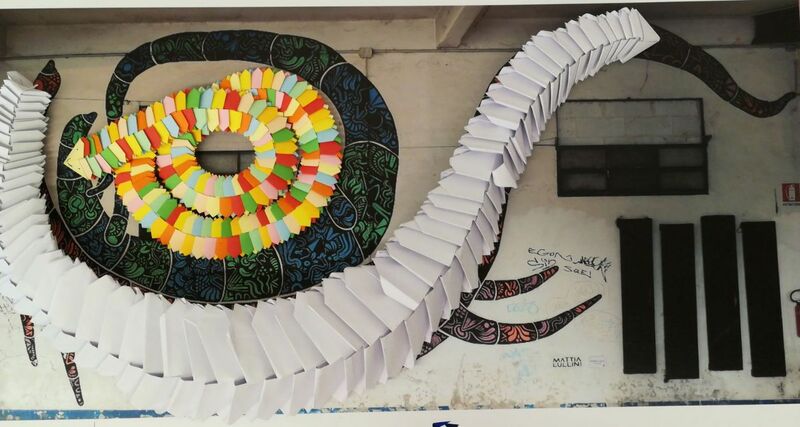 He has been working with paper folding techniques for the past few years. He has taught paper folding techniques in many schools and public venues. Come help build a large geometric sculpture using hundreds of pieces connected with cable ties. If you can thread a cable tie through a hole or count to ten, you can help! 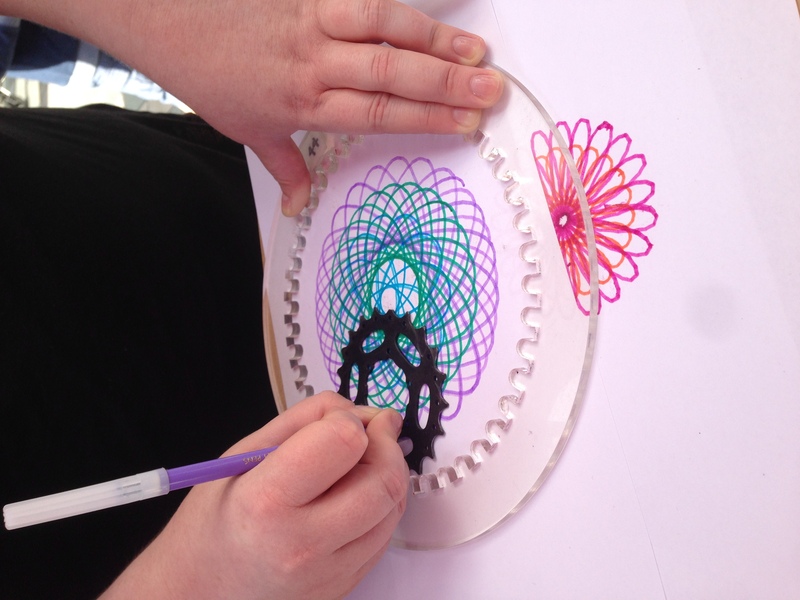 Draw geometric flower patterns (hypotrochoids) with felt-tip colour pens, using recycled bike cogs and specially laser-cut plastic wheels. This hypnotic drawing activity explores the beauty of phase patterns and prime number factorisation. This project was inspired by the classic Spirograph toy, and by artist Nick Sayers’ love of cycling. He has also made large geometric drawing machines from old bicycles: Bicycle Spirograph 2 (Paper) draws inverted Spirograph patterns (epitrochoids) on square art paper, Bicycle Harmonograph draws Lissajous curves on A4 paper, and Bicycle Spirograph 1 (Sand) draws 1.5-metre Spirograph patterns with sand on a vinyl mat. You are invited to puzzle with a lot of playable didactic materials and try the “STEAM Kindergarten suitcase”, and many other interesting tools. Age 4 – 99. We will examine and color in quilt patterns to find irrational numbers in the patterns. Moving Mathematics explores the beauty and precision of mathematics through body movement and the space around us. Explore the mathematics inside your own body and understand interesting phenomena by becoming a part of different moving geometrical shapes. Everyone can join in and try out different easy to approach activities. Dancing Snowflakes activity allows participants to explore rotational symmetries and create beautiful shapes through movement. Everybody can join in in this easy exercise that bolsters creativity and cooperation and demonstrates the beauty of mathematics through your own body movement. 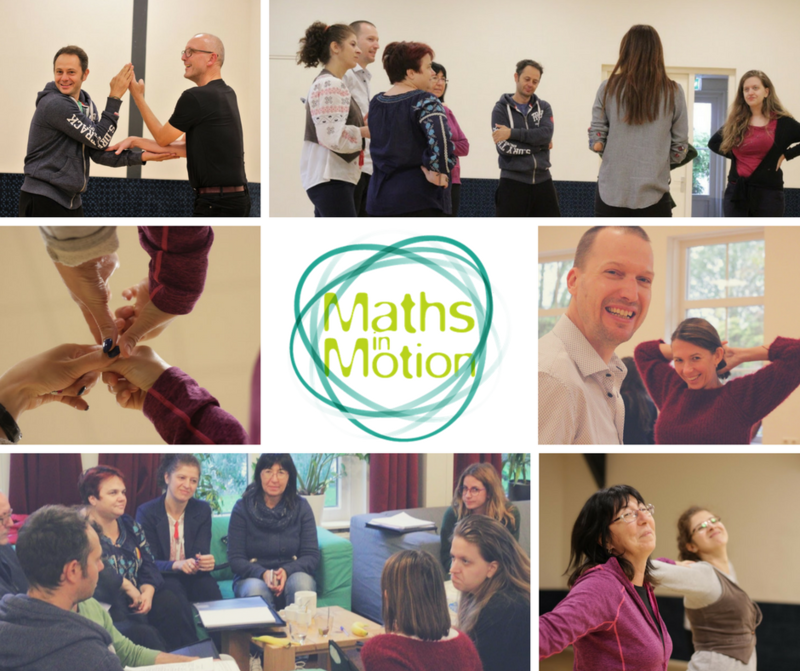 The activity is created by the Experience Workshop coordintated by Finnish team of Maths in Motion, an Erasmus+ project about how to use body movement as a tool to teach mathematics. / Zero Point Gravity activity is a proposition to explore one’s body and bone structure in the space; how to be strong like a house and in perfect balance — even while moving! You will be able to experience all this through simple and fun exercises that will make you feel the gravity point in your stomach like in a roller coaster. 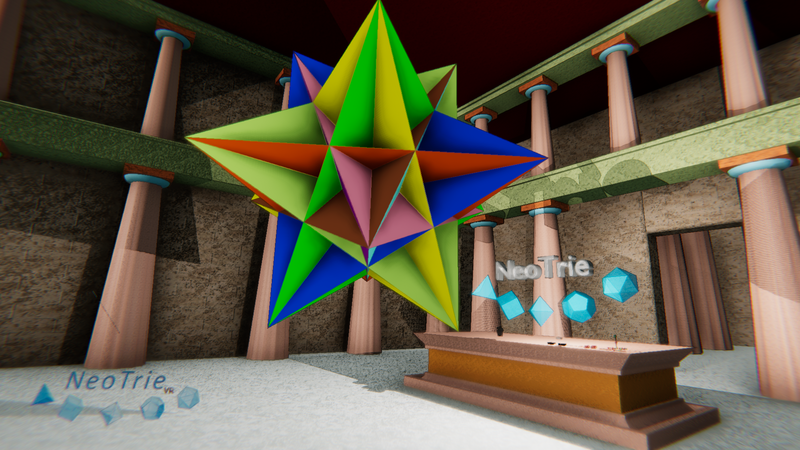 You can try NeoTrie VR, a new software package which is currently being developed by Virtual Dor and the University of Almería. This software enables people to create, manipulate, and interact with 3D geometrical objects and 3D models in general, of several types. 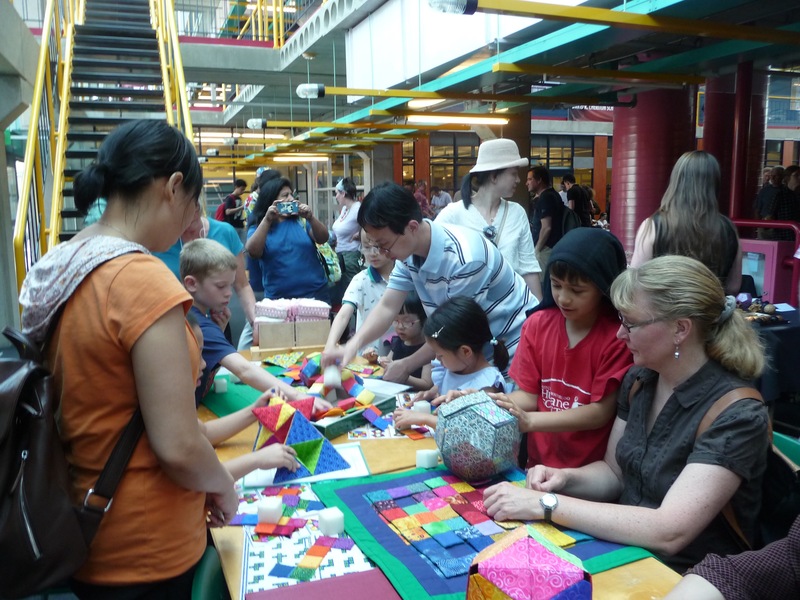 Participants can play puzzles based in hyperbolic geometry. A bit like Chess, but on the hyperbolic plane — it appears we are surrounded, however there are more directions in the hyperbolic geometry, so we can still escape! – Angles of a triangle sum up to less than 180 degrees here, which makes the screen orientation change after you return to the same location. Can you make it point any ways? 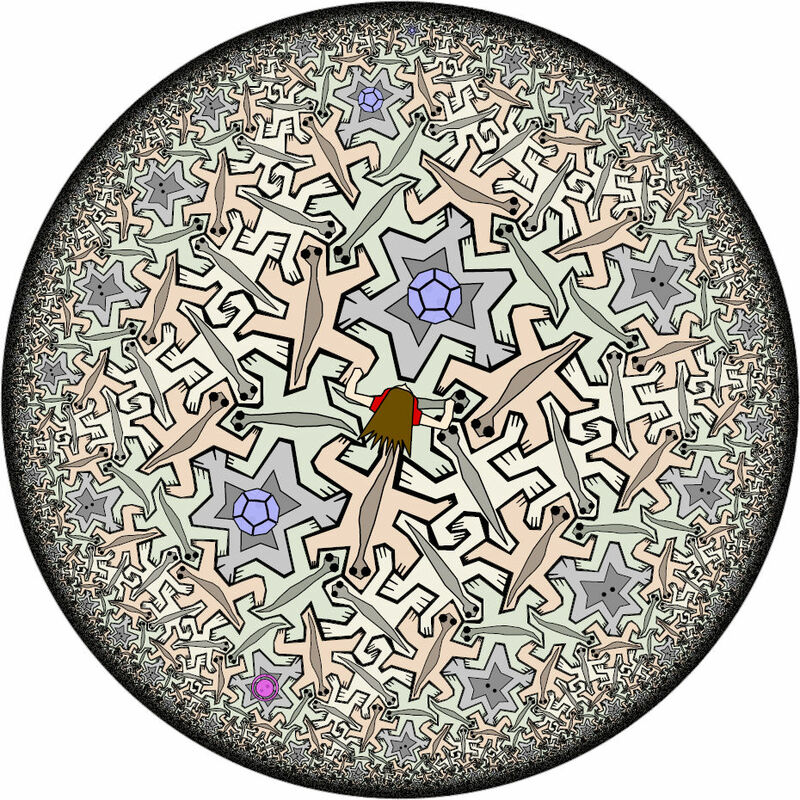 The puzzles will take place in the world of HyperRogue, the players will see various hyperbolic shapes, such as horocycles, infinite trees, and tesselations. The players will be encouraged to ask any questions about hyperbolic geometry – we will be able to answer them with interactive presentations, e.g. of various models of hyperbolic geometry (hyperbolic crochet, both in the real world and on-screen), comparing our puzzles with their Euclidean and spherical versions, applications to data visualization. In this activity, we will use the sensors available in smart phones to create music. Using sensors to make sounds is a way of using data to explore the world around you. Sharp beeps and differing tones can help make noticing subtle changes in the data you record much easier. 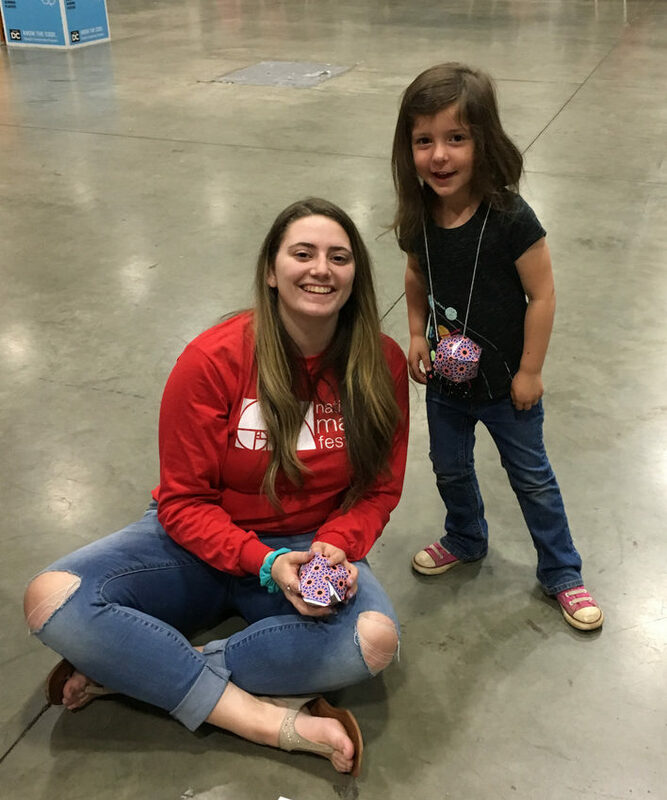 In this activity, participants have the option to use a compass sensor, luminosity sensor, build an electromagnet and use their magnetometer, or a combination of all three to make music and explore the world around them in whatever way piques their curiosity most. Come “See” place value number systems in a new way: put Anna Bracelets on Jena Set graphics that scale to infinity. These self-similar curves are called monster curves, and in this workshop we will show kids age 0-99 how to use the curves and bracelet rings to simplify learning elementary math. We will discuss how Stanislas Dehaene’s research on number sense and an ancient Egyptian column capital (referenced in Wikipedia related to Cantor Sets) could be understood as a first model for numbers. Then we will discuss how, according to Susan E. Carey, Dept of Psychology at Harvard University, singing and talking to kids transitions them from what we are calling the first model of math to the second, the base-ten model. The workshop provides visual learners a new bridge between the two. See how a Yoruban (Nigerian tribe) style tie-dye pattern can be seen to present a version of a number line, and how this backdrop can be used to teach math patterns. 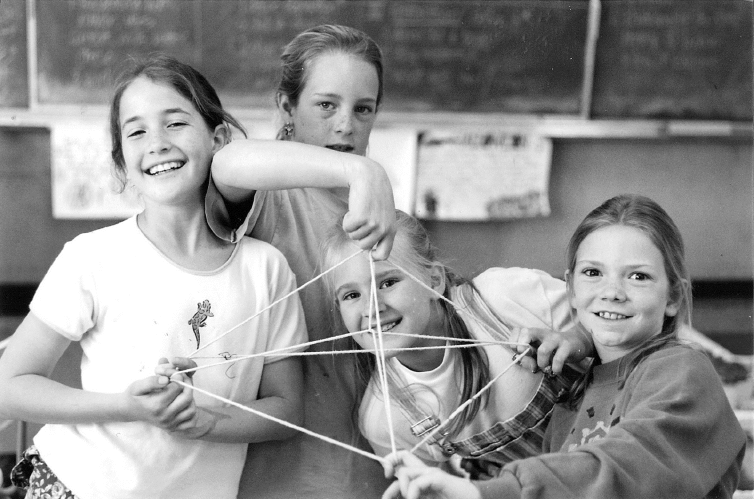 Anna’s rings, Allison’s resist-dye fabric and Jena’s sets together, the SeeMath system, may provide a math reading system for elementary math education that can act as a replacement for auditory cues, succeeding in ways that popular systems fail. The talk will take place every 30 minutes during the activities. 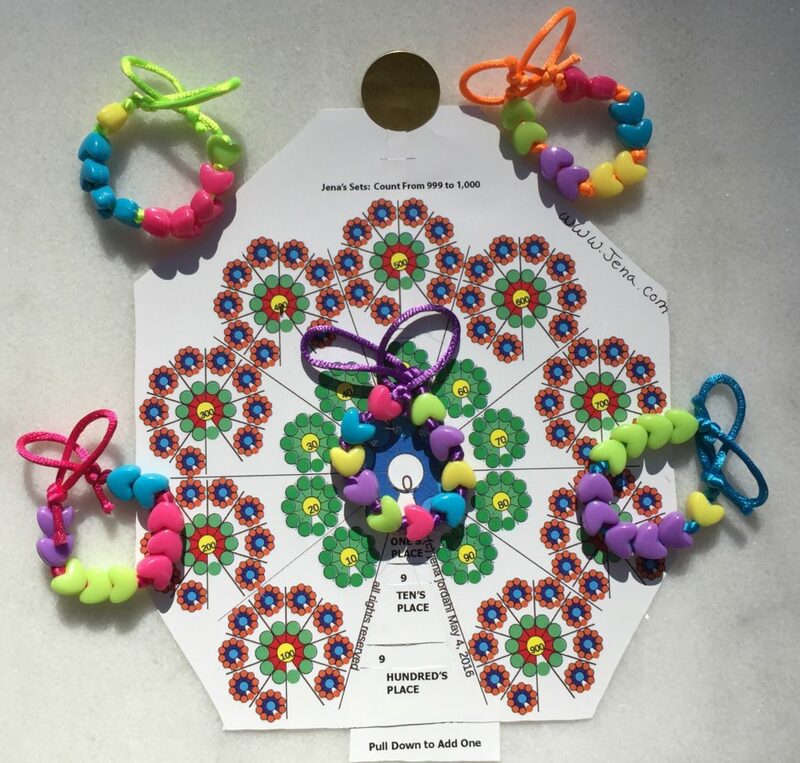 Come play with bracelets and monster curves to broaden your view of the beauty behind numbers. 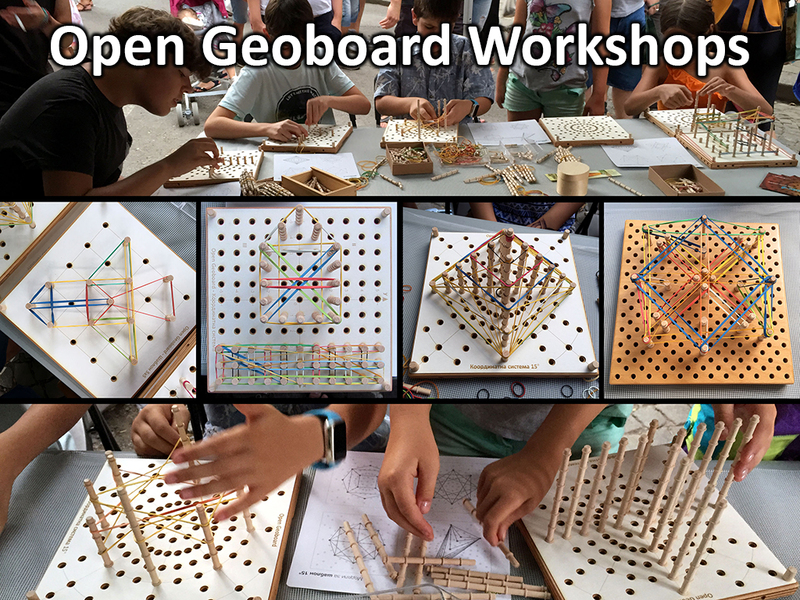 Open Geoboard is a wooden educational platform for exploring and learning math in 2D and 3D. Loved by educators and kids 3-99. It’s Open Design, offers blueprints for DIY and Fab Lab fabrication. Open Geoboard is a wooden geometric board and a platform through which kids explore and learn mathematical concepts like figures, forms, symmetry, 2 and 3 Dimensional space and many more. It can be used as a learning material at home by kids and their parents, and in the classroom by teachers and educators. The geometric board and different rubber bands, wooden pegs, templates and other elements are the tools for making diverse forms, figures, objects, art and many more in two- and three dimensional space. Changing the template on the board makes it a base for board games like Ludo, Chess, Maze etc. Depending on their age, kids and their parents will make different shapes, objects, play math games and more with our geoboards, while learning math and having fun. PocketLab is relatively inexpensive tool contains what used to require rooms full of sensors in a package small enough to fit several in your pocket. We will set up several small experiments that will have participants generating and analyzing data related to linear motion in all three dimensions, angular motion, magnetic fields, barometric pressure and temperature. All of these can be investigated with this device, by children of all ages. McMahon’s Madness is puzzle begins with the simple question, “If you paint the faces of a cube with six different colors, how many different arrangements can you make?” but this is only the beginning of the puzzle’s wealth. This puzzle has much to give in the arena of spatial reasoning, combinatorics, and logic. 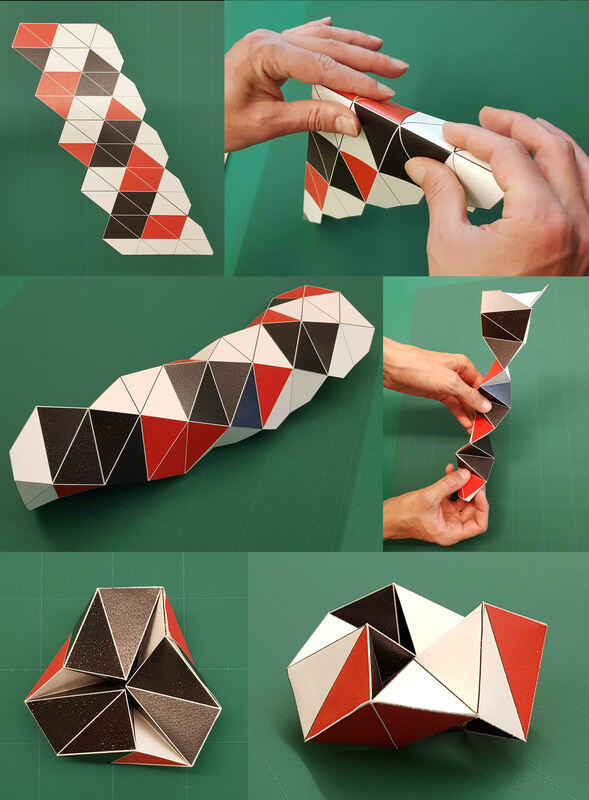 During this activity we will build paper models for a completely new class of kaleidocycles. Kaleidocycles are internally mobile ring mechanisms consisting of tetrahedra which are linked through revolute hinges. 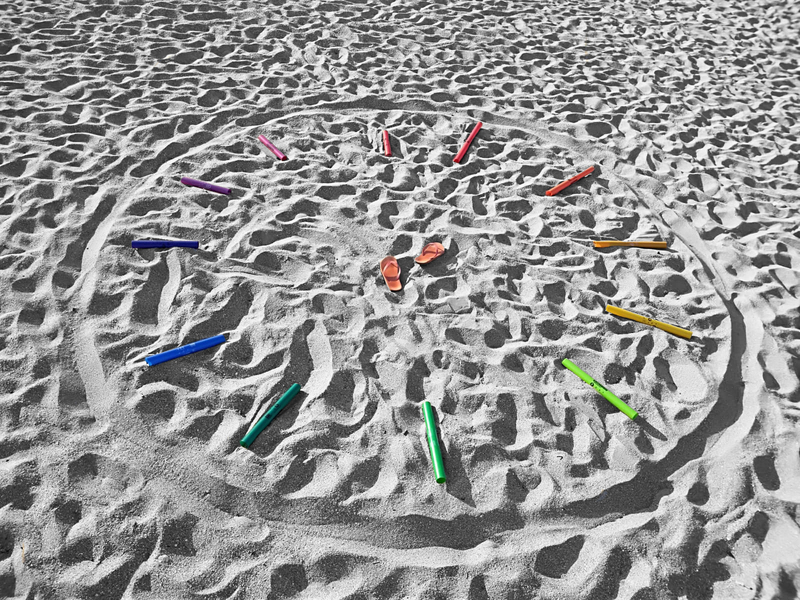 Instead of the classical, very popular kaleidocycles with even numbers of elements (usually six, sometimes eight), we will build kaleidocycles with seven or nine elements and several different surface designs. We will also provide plain white paper models which can be colored individually with markers or other means. These new kaleidocycles have only a single degree of freedom. Further, they have the topology of a threefold Möbius band, a shape which was used by M.C Escher in his picture “Möbius Band I” from 1961. This shape is also familiar in stylized form as the recycling symbol. Because of this property we call these objects Möbius Kaleidocycles. By using modular arithmetic, we transform sequences of numbers in steps, and steps in music and geometry. Partecipants are fully involved in an experience where walks become musical patterns and where they create by these their own musical composition. At the end of the activity, they can make the geometric figure related to their composition. Workshop for introducing the Zometool modelling toolkit. 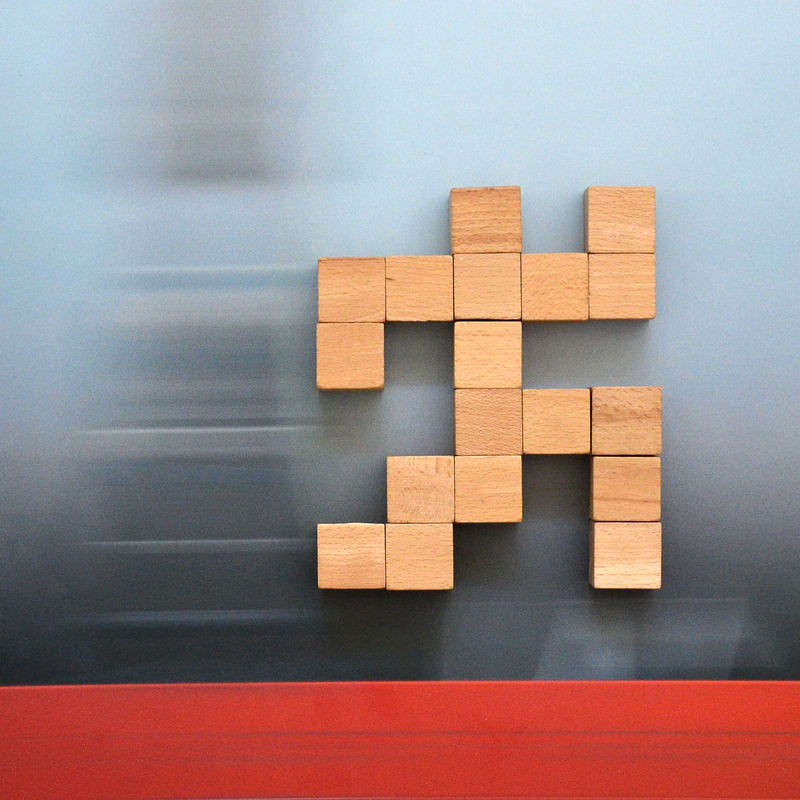 You can make figures with wooden blocks on wooden panels. Each panels has 5 x 6 = 30 holes for blocks with pegs. First you can use 10 blocks to make different connections between the opposite corners. The second challenge is to use blocks to make human figures (with arms, legs and head) as much as you can make. You can try all possible combinations and draw the results in a little notebook. So you can create a series of all the figures you can think of. With the books you can check if you haven’t overlooked any figure and how many possibilities there are. Have fun! 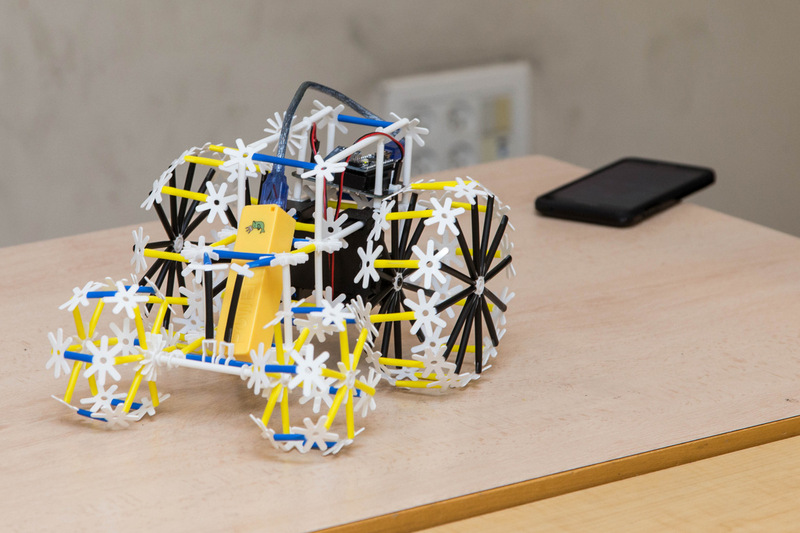 Participants can play with the soccer robot they made of 4DFrame Mechatronics controlled by mobile devices and we build up the Warka Water tower from Super 4dFrame. Experience Workshop presents a screened exhibition of mathematically inspired children artworks from all over the world. Can’t wait to see Veronika Irvine’s bobbin lace! 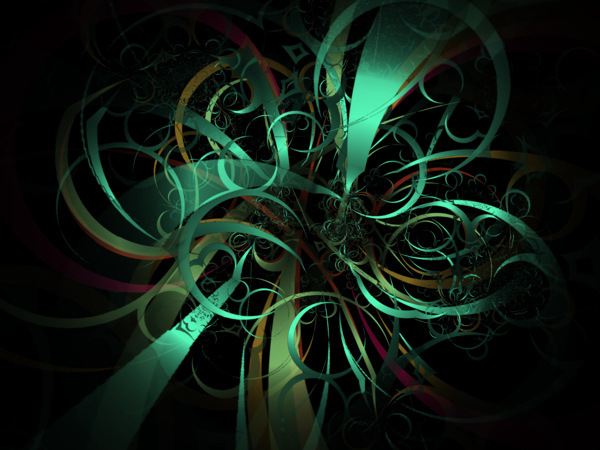 Combining not only art, math and computer modelling – but a age old skill as well. Exciting stuff! From my engineering background, I also enjoy envisioning the industrial applications of Veronika’s lace ‘structures’. I’m looking to purchase the tessellation puzzle of Islamic geometry by Bonner. how can I source this.